A Very Merry Christmas Time! It’s a very Merry Christmas Eve here at my parents, and for some reason I’m kind of actually into the holiday spirit this year! 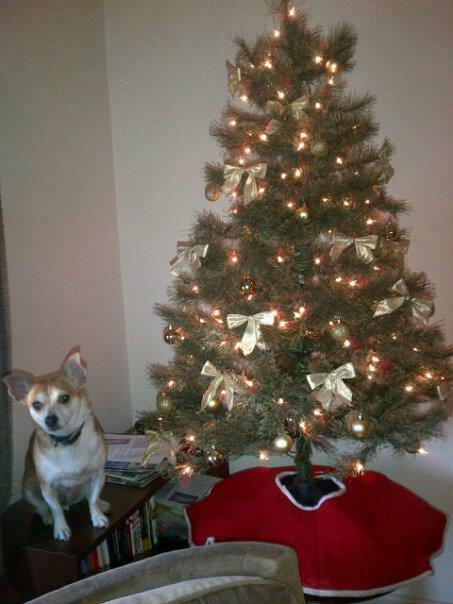 My dog Toby and the tree. Toby woke me up at 7 a.m., so I decided to stay up and decorate my Dad’s tree — a Christmas Eve tradition for as long as I remember. The rest of today is going to be filled with baking a few homemade presents, wrapping presents, visiting with my Mom and picking up stuff for Christmas dinner. Yes, I’m going to be one of those last-minute shoppers in the grocery store. Usually I try a new vegetarian recipe for the holidays,but the other night my Aunt and Uncle asked if I would make eggplant parmesan for Christmas. I was kind of surprised at their request, because although I ate it all summer because of the ridiculous amount four plants produced, I haven’t made it for them in at least two or three years. And, of course there will be baking today. For as long as I remember, I’ve always baked a banana or cranberry bread for my parents’ neighbors for Christmas. Today, I’m thinking of doing a cranberry banana bread … the best of both worlds. Christmas is filled with old and new traditions, and I’d love to hear about your family traditions. Feel free to upload photos of your celebrations, what you’re cooking or your holiday decorations on our Facebook page! I hope you have a very merry and happy whatever you celebrate! Merry Christmas Michelle! Your little helper looks so sweet sitting next to your beautiful Christmas tree. I need to try your eggplant parmesan one of these days! Merry Christmas! Your eggplant parmesan looks wonderful!